As banks are gradually expanding their agent banking activities, the number of agent banking accounts has already exceeded 12 lakh in the country. According to the quarterly data (October to December, 2017) of Bangladesh Bank (BB), the number of accounts with agents increased to 12,14,367 from 10,38,242 in the July to September quarter of 2017. During the October-December period, the number of agents increased to 2,577 from 2,015 in the July to September quarter and the number of bank agent outlets also increased to 4,157 from 3,565 in the same quarter. During the quarter, deposit collection through the agent banking went up to Taka 1,399.39 crore, which was Taka 922.08 crore in the July to September period. During the October-December period, official data show, Bangladeshi expatriates sent Taka 1,982.02 crore through the agent banking channel, which was Taka 1,240.34 crore in the July to September quarter. Terming the agent banking a great initiative of the central bank, he said generally a bank needs a number of staff and huge expenditure to operate a branch. "If one bank can run its activities through agents, it will be helpful for both the bank and the customers," said Additional Managing Director and Chief Operating Officer of Mutual Trust Bank (MTB) M Hashem Chowdhury. Hashem said MTB is providing various agent banking services, including cash deposits, withdrawal, remittance disbursement, small loan disbursement, loan recovery, and cash payments, to its clients through 50 agents and 50 outlets across the country. The central bank launched agent banking in 2013 by giving license to Bank Asia. A total of 18 commercial banks have already taken licenses from Bangladesh Bank while 14 banks are running their activities across the country. 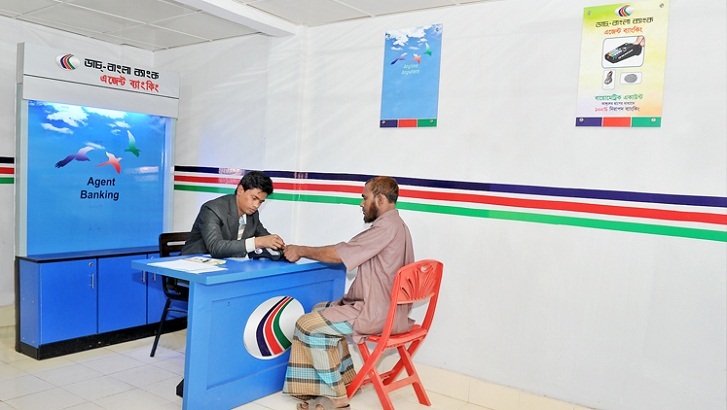 The commercial 14 banks, which are currently running agent banking activities, are Dutch Bangla Bank, Bank Asia, Al-Arafah Islami Bank, Social Islami Bank, Modhumoti Bank, Mutual Trust Bank, NRB Commercial Bank, Standard Bank, Agrani Bank, First Security Islami Bank, Mid Land Bank, The City Bank, Islami Bank Bangladesh and The Premier Bank.